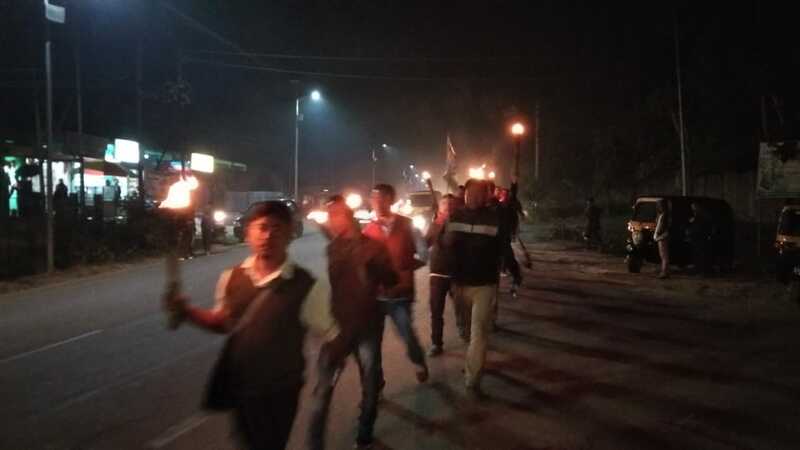 The Joint Action Committee for Autonomous State (JACAS) has taken out a torch light procession from Recreation Park to Diphu town of Karbi Anglong district in Assam on Monday evening in protest against the contentious Citizenship (Amendment) Bill 2016. On January 19, the social organization has came down heavily on Assam Cabinet minister Himanta Biswa Sarma for his statement that the Karbis are not opposed to the Bangladeshis being given citizenship. The protest procession was participated by a large number of people which concluded at Semson Sing Ingti Memorial Park. At Semson Sing Ingti park, JACAS chairman, Kharsing Teron asserted that what Dr Sarma has said was totally false. Slogans of ‘We oppose CAB’, ‘Citizenship (Amendment) Bill Batil Korok’, ‘Narendra Modi Hosiyar’ and ‘BJP government Hosiyar, Hosiyar’ were shouted by the torch holding protesters.